It seems like those few days before Christmas and New Year’s often leave us without something productive to do. It’s a holiday, yet it’s really not. I finally got Mom set up on Pinterest – she had been bugging me to show her how it works for a while. Not sure if that was something that would normally encourage productivity but in our case, it has. The past few Christmas’s, I’ve made Mom some stuffed felt something. This year it was a stuffed felt cat that I shared earlier this week. I also gave her a felt cat of my own design. It seemed natural that she would start looking around at the felt pieces on Pinterest. She ended up looking at felt elephants. We somehow found a vintage elephant drawing from a book on making children’s toys and we both thought it was cute and thus the 2014 After Christmas Elephant Challenge was born. My idea? We would both independently design our own version of the elephant. With the blanket and head covering, there just seemed so many different options for making the design our own. In the end, Mom’s elephant looks more like the original than mine does. I didn’t like the position of the legs, so I changed my legs. I also included a more showy tail and made the ear larger. I haven’t seen Mom’s finished elephant yet, but I’ll be able to share both of our designs with everyone tomorrow. 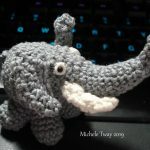 I’ll also be including my elephant pattern so that you can make your own version. 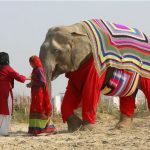 If you would like to join the fun, just take the elephant image in this post and turn it into your own brooch. 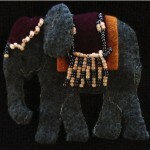 Or use my felt elephant pattern.